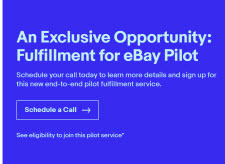 eBay invited more sellers to participate in its fulfillment pilot program that we wrote about in January. The Fulfillment for eBay program is part of eBay's efforts to compete with Amazon and offer shoppers faster shipping for items ordered from its sellers. In the invitation featuring the headline "You Sell It. Our Partners Do the Rest," eBay explained that its partners will "pick, pack, and ship" sellers' orders - it did not provide the name of those partners. - "I keep my inventory lean, and sometimes it takes up to 90 days for my products to be made and delivered to me. - "I am not very confident in eBay at this time. - "I also seem to remember something about a few fulfillment warehouses that closed down last year or the year before that had sellers in disarray. Scary." He may have been referring to this article about an FBA-prepping company that shut down abruptly in August. However, he was open to joining the program at some point. "In the future, if they are able to ship items to the customer in a day or two no matter where they are in the US, I may participate, even if I have to store items in multiple warehouses." For sellers who are new to using third-party fulfillment programs, there is a potential downside they might not consider: the tax implications of storing inventory out of state. TaxJar wrote last year, "Sellers who use 3rd party fulfillment have complicated sales tax obligations. For example, Amazon FBA sellers can have sales nexus in up to 24 U.S. states because their inventory is stored for sale in an Amazon fulfillment center. If eBay provides a fulfillment service, eBay sellers could find themselves in the same predicament." However, in a post-Wayfair world, that may impact fewer sellers since they may already be on the hook to collect and remit sales tax. But there could also be downsides for not participating, if Amazon FBA is any indication - including the potential for lower visibility and missed perks. For example, Amazon prevents third-party sellers from selling toys during the holiday shopping season unless their inventory is stored in an FBA warehouse. One upside to using an eBay fulfillment service would be if eBay launched a Prime-like program, which it has done in Germany and Australia (the program is called eBay Plus). Our Partners Do the Rest. Fulfillment for eBay is a new end-to-end service where our partners pick, pack, and ship whatever you sell. You get variable rates depending on the product's size and weight. From answering questions to handling claims, eBay's got you covered." The email included a link to this page on the eBay website. I doubt that ebay will be around long enough to fully implement this program. For myself, I almost always ship within 24 hours with no problem; 48 on the outside. Since ebay can't do anything else right, who would trust them with fulfillment? The real winners are going to be the sellers who keep this so called program as far away from their store as possible. CAUTION ! Punji Sticks directly ahead. Followed by Bear Traps. and Finally Tiger Trap/Pits for those LUCKY FEW who made it past the first two. Letting EBAY do anything at ALL for me is out of the question given that they cannot successfully so much reliably SHOW my 1,437 GTC listings in my PREMIUM LEVEL eBay "store". Sheesh. How many morons do they think they have sitting around just mindlessly Grabbing at the Bait setting themselves up to get DONE, DONE AGAIN, and then finally ReDONE by eBay yet again? Lol. I like the comments so far. At least there’s hope that sellers understand that eBay can’t do ANYTHING right. They simply want to control every single aspect of every single thing you do on their collapsing platform. I'd be terrified if eBay was fulfilling my orders. They can barely keep the site running, yet I would have to hope they would send the right item to the right person? I foresee a massive number of the wrong items being mailed out. And the "Support, Protection, and More": you already know there's no support or protection on eBay, so what hope is there that things will be better if eBay is fulfilling. "I doubt that ebay will be around long enough to fully implement this program." eBay's been around for over 20 years! I expect them to have 20 more. . . .
And I'm sure Ebay is doing this for free-right? Look at the massive costs increase for buyers when they buy from sellers that are just using the Ebay Global shipping program. Now imagine if you let Ebay knuckleheads come get your stuff-pack it and ship it. eBay wants you to join "the program" but the page has ZERO details - not a one. All you can do is "schedule" some kind of call. OBVIOUSLY, eBay is afraid to explain how it works, whos responsible for what and what the costs are! Its like eBaypay - why the games? why the shenanigans????? Can any of eBay crooked lawyers make an announcement on what the details are? or are they too busy hiding? I've been around since before the Beatles. I see all this online nonsense shooting itself in the foot and giving birth to the resurgence of Brick and Mortar stores. I want to have a place near by to go for a ride to get stuff. I don't want to wait Days for stuff. I like listening to great music while driving to Point B to get stuff. If good old fashioned shopping, and other business was available locally, we could save THOUSANDS of dollars eliminating "online". Online is for people who don't want to expose themselves to real life. PACE: No, the ebay lawyers can't reveal the details -- because they haven't figured them out yet! TOOL: If ebay lasts, it will have to be in a radically different form; it will be unrecognizable to us. In any event, we will all be gone. Don't take it too hard. Just exacly what part of ''You Sell It'' applies here? Except for the part where YOU are doing all the sourcing and listing WORK of course. eBay wants to be the ''Tom Sawyer'' of eCommerce, and want YOU to pay for the privelege of grabbing a brush and whitewashing their fence. Quote: eBay wants to be the ''Tom Sawyer'' of eCommerce, and want YOU to pay for the privelege of grabbing a brush and whitewashing their fence. Very nicely put and fairly well explains it all in regards to eBay and ''its sellers''. toolguy writes: "eBay's been around for over 20 years! I expect them to have 20 more. . . . "
Remember when that analyst said eBay would only last another five years? Well, eBay is now at four years and counting down. Why aren't they passing this along NOW? Prices will drop across the site, and sales will increase right? Won't they make more money without having to lift a single finger? Instead it makes sense to try and do everything amazon ever did with the last dying breath? patchwork together some unreliable "partners" to do the same thing every single business-level ebay seller can already do with their eyes closed and hands tied behind their back? What's next? Cloud computing? eBay Video? Well, they've got the marketing spiel down - only problem is that they seemed to have forgotten how to get there. UPS also offers a FBA fullfillment setup. There are several "FBA" fullment centers - UPS, Fulfillment Works, many centers. It's possible EB is using one of those centers, whereas the regular seller can do the same. Just send your stuff to a fulfillment center. You don't need EB or AMZ. I've been selling since 2006 (as my username states). I remember back in 2006 when I told people I sold on eBay their eyes lit up and they would say "I love eBay!" Now I tell people I sell on eBay and they say "I used to love eBay but now I can't ever find what I want." My wife and kids also refuse to shop on eBay because it takes too long to find what they want. They'll spend about an hour browsing the other site but won't even spend a minute on eBay because the search is so frustrating. Just another step in the hiding of our customers from us. Already eBay has made it difficult to contact buyers other than by eBay message in order to limit off-site sales. FBE makes contact impossible. And makes eBay even more impersonal than it already is. Forget about repeat customers--they won't have any idea who you are.